Our funeral home can be easily located just off of Hwy 41 on North Richmond Street; across the street from Mary’s Family Restaurant and American National Bank. We are fully handicapped accessible and ample parking is available just steps from the carport entrance. 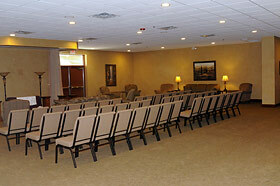 Our inviting and relaxed atmosphere can accommodate large funerals and yet be intimate for small gatherings. 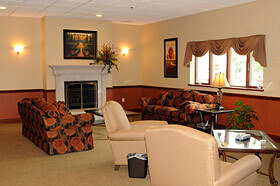 Our fireplace gathering area is great for personal conversations. 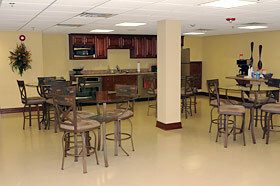 Families can take advantage of the full kitchen facilities. Refrigerator, oven, microwave and buffet counter are available to serve friends and family. 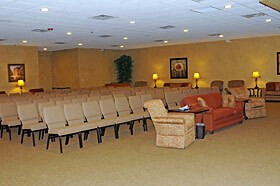 Families may choose to utilize this room for snacks during a visitation and/or have a small luncheon. Seating is available for 20. Our spacious luncheon room is available for larger gatherings. Coffee is always on! 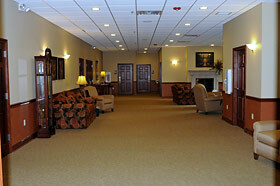 With the newly remodeled funeral home, we can now accommodate families with a luncheon on the premises. Most families choose to have a luncheon catered and served immediately following a visitation and/or service. There are several catering choices available. The funeral home will make these arrangements and design the room for the appropriate number of guests. 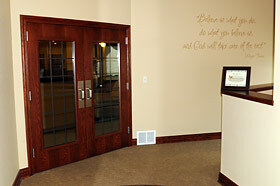 Two large chapels are available with the option to open the dividing wall for larger funerals. Seating is available for a total of 500 people. Each chapel contains a separate, state-of-the-art sound system. Video-taping and web-casting are available. 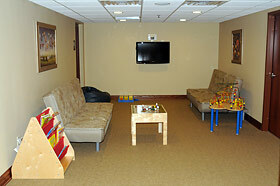 A special children’s room is located adjacent to our kitchen facilities. Children can take a break to play or watch videos. A baby changing station is available in the adjoining woman’s restroom. Spend some time browsing through our grief support library. Books may be checked out at our front desk. Suggestions for new titles are always welcome! We offer a large selection of caskets in a variety of price ranges. We can also custom order any casket you may have seen. We offer personalization options as well. Our staff provides unlimited time to browse and make personal decisions. Each casket is inspected prior to display to assure your selection is free of cosmetic defects. Burial vaults, or outer burial containers, are required by most cemeteries in the state of Wisconsin. 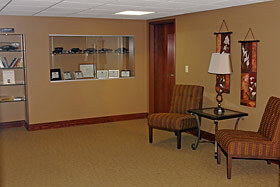 We have on display miniature replicas of the actual vaults available. Vaults protect the casket and are necessary to maintain cemetery grounds. Vaults range in price and quality. While all vaults offered meet minimum cemetery requirements, some vaults provide more protection than others. Our trained staff will educate you regarding the grades and benefits of protection available. Our knowledgeable staff will assist you in properly honoring your veteran. Staff will explain all of your benefits and assist you in how to obtain proper paperwork through the Veteran’s office. A special veteran’s casket is available, as well as special memorabilia. Our urns vary in all types of shapes, sizes and materials. We even sell biodegradable options. Our staff can assist you in selecting special options from our many urn catalogs as well. Personal engraving is also available at cost. We also offer small memento urns as well as jewelry options. When selecting a monument, lasting quality is important. A tribute to memorialize your loved one is offered here in quality granite and bronze. We are happy to be working closely with Appleton Marble & Granite Works. Come in and see our display of monuments. Our prices are the most competitive in the area, and our quality of material is second to none.